From two extensive galleries by European publishers, the Frame Spot offers stunning art images printed directly onto canvas to any size. Using the latest print technology, the ink appears to sit on top of the canvas producing a painterly effect with rich colour density. Print sizes can be customised to suit any space, no matter how large. The printed canvas is finished by stretching and/or framing to create a sensational, cost effective wall feature. 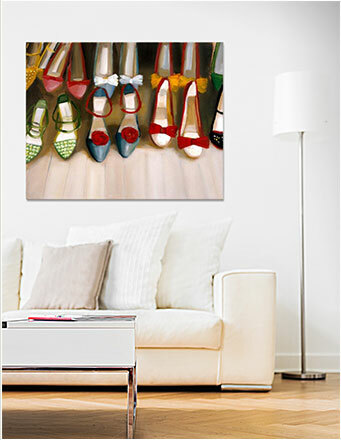 Your printed canvas size can be as small or as large as your wall space allows. Images are printed onto a high grade 265gsm canvas. The printed canvas is stretched over a solid frame. The print continues to wrap over the edges or the canvas edges can be left white depending on taste and décor. Your stretched canvas can also be custom framed. See canvas stretching for more info. View our two galleries with an extensive collection of art images to choose from.